For the past couple of years much international economic debate has focused on issues of growth and austerity, while regulatory debate has focused on Basel III and systemic risks. The only consensus has been on the necessity for reforms to avoid a repeat of recent crises. In the past few months, political and financial developments have shown that both issues are still up in the air, and there is no clear consensus on any of these matters. In Europe the wave of elections has created more uncertainty than expected. And this uncertainty is prevalent not just in nations beset by crisis, such as Greece, but also in relatively secure countries. Rather than concrete results from the stability measures adopted by individual countries, what we are seeing is a renewed debate on the austerity measures. In France, Nicolas Sarkozy has lost the presidency, and in Germany, Angela Merkel has lost some key regional votes because of this change in perspective. François Hollande, the new French president, seems—like many others in Europe—to favor a policy that embraces growth, not simple austerity. But we are left to wonder what the European consensus on these issues will be, if there is one at all. J.P. Morgan's announcement of $2 billion in trading losses in London reignited the debate over the Volcker Rule and the proposal to abolish proprietary trading by commercial banks in the US, forcing a renewed discussion on the use and meaning of hedging strategies, speculation and over-the-counter trading. But, again, no consensus is in sight. 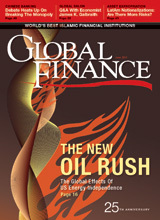 In this issue of Global Finance we consider the quest for—and global impact of—US energy independence. The outcome, argues contributing writer Michael Shari, "could well turn out to be the greatest paradigm shift the international community has seen since the end of the Cold War." 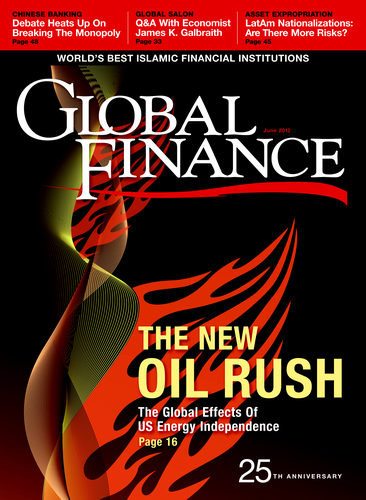 In addition, at Global Finance we are preparing a special issue for the 25th anniversary of our publication, which will be released later this month, focusing on the future of the financial sector while examining its transformation over the past quarter-century.